FRANKLIN, Mass. – After the game ended, after the bulk of the crowd had filed out of the gym that only a few minutes before had been packed to capacity, and after speaking with his team in the locker room, Franklin coach C.J. Neely was left to reflect on how different the emotions were for his players this year compared to the last time that the Panthers faced Algonquin. 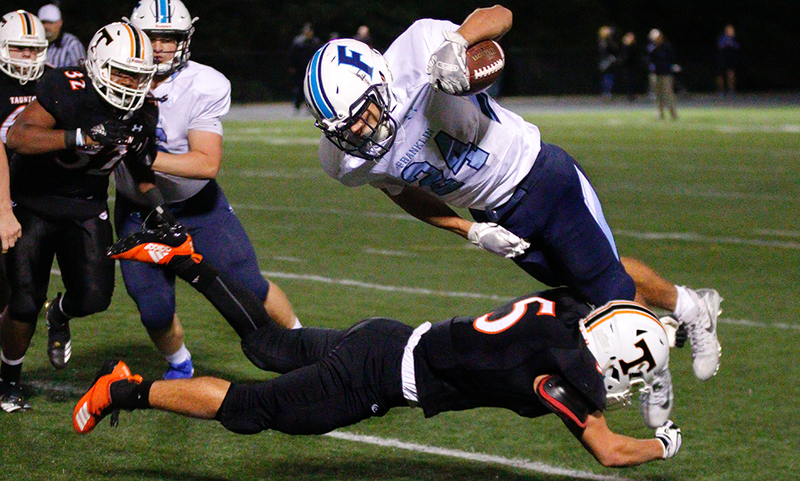 Last season, Franklin (16-5) beat the Tomahawks to win the Div. 1 Central title on its way to a second straight state championship game appearance. This year, the Panthers hosted Algonquin in the opening round of the tournament and the Tomahawks took advantage of the opportunity to avenge that loss, pulling out a 63-60 thriller. 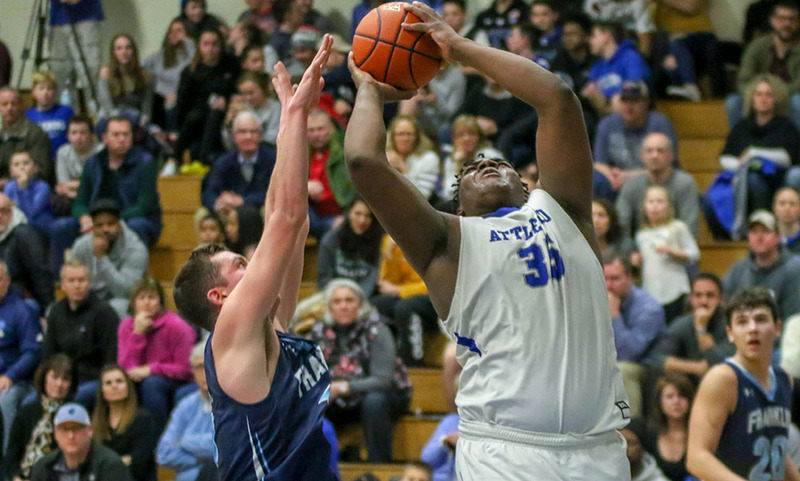 The visitors made their share of huge shots, whether it was freshman Alex Karaban burying a deep three in the fourth quarter to push the lead to four points or senior Sean Cullen ignoring the Franklin fans behind the basket to drain a pair of free throws with 22 seconds remaining. But, the Panthers were also their own worst enemies, shooting only 13-of-25 from the free throw line. In a game that came down to the final possession, those missed opportunities were the difference. When the game tipped off, there was still a long line of people waiting to get in the door, as the atmosphere felt more like a final than the opening round. The teams came out firing like it was a final as well, with Algonquin jumping out to an early 6-0 lead before Franklin answered with six straight of its own. Sean Leonard scored four points in the first and Jalen Samuels (15 points,10 rebounds, and four blocks in his final game) got the Panthers within one when he drove baseline and finished with a one-hand slam. Chris Edgehill (team-high 20 points) gave Franklin its first lead with a deep three in the final seconds of the quarter. Algonquin used a 4-0 run to grab a 17-16 lead but Samuels scored back-to-back buckets to get the lead back for the hosts. Another three from Edgehill opened up a five-point lead and then Jack Rudolph hit a pull-up jumper in the lane. After Edgehill knocked down three free throws, Franklin led by seven, but Karaban scored on an offensive rebound and Brian Duffy (game-high 24 points) buried a three to cut the lead to just two. 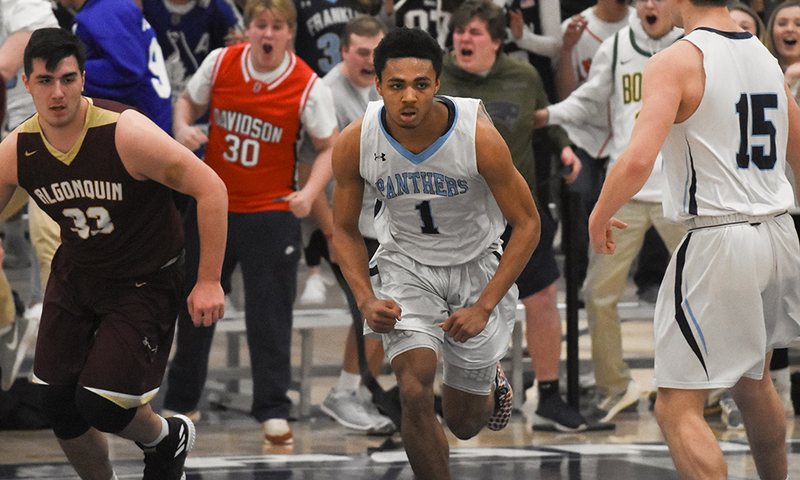 Samuels drove to the basket to finish the half with Franklin up 32-28, but the Panthers went only 5-of-10 at the line in the quarter and 8-for-16 in the half. Those points that were left on the board would prove costly in the end. In the third quarter, Rudolph got things started by knocking down a three off a set play. It felt like Franklin was on the brink of breaking the game wide open but instead Brian Duffy (game-high 24 points) caught fire. He knocked down three free throws, drilled a three, and then hit a jumper. His personal 8-0 run put the Tomahawks up one. Edgehill got into the lane to set up Will Harvey for a layup and then Rudolph hit his second three of the quarter before setting Harvey up for another layup. Rudolph and Harvey combined for all 12 of Franklin’s points in the third, keeping the Panthers up by three heading to the fourth. Duffy continued to have the hot hand in the fourth, tying the game with a three, but it was an unlikely source of offense that gave Algonquin the lead. Cullen had only two points through three quarters and was largely a passenger on offense, but he drilled a three to give the visitors a lead and then scored on a three-point play to extend the lead to four. He scored 10 of his 12 points in the fourth. Franklin kept battling back. Rudolph stole an errant pass, fed Leonard in the paint and he dished it off to Samuels for a layup that made it 52-51. Edgehill hit a pair at the line to make it 58-57 only to have Karaban come down and bury a deep three to make the deficit four. Edgehill answered with a deep three that made it 61-60, but on the other end he committed a foul with just 13 seconds left on the shot clock and 22 ticks left in the game. Cullen stepped to the line and seemed unfazed by the moment, hitting both right in front of the Franklin student section. While Franklin was struggling at the line, Algonquin was 8-of-10 at the stripe in the second half following Cullen’s makes. Franklin ran the clock down to 11 seconds before Edgehill hit front rim on a very deep three. A foul on the rebound put Algonquin at the line with a chance to seal the win. Ironically, the visitors missed them both and Franklin got one last chance to extend the game. Samuels snatched the inbounds pass away from a defender at mid-court, but he couldn’t get an off-balance heave to the rim and the Tomahawks bench stormed onto the court to celebrate. Clemente is an imposing force on the offensive and defensive lines for the defending Davenport division champions and Div. 3 Super Bowl runners-up. As both a guard on the offensive line and defensive tackle, Clemente impacted the game on both sides of the ball and helped the Rocketeers control the battle in the trenches. He has the size and power that would be expected from someone in his position but also has quick feet and the athleticism to stay in front of opposing linemen or pick up blitzing linebackers. One of his most impressive traits is the ability to pull from his guard position, combining speed and power to clear the way for the run game. Clemente’s presence in the offensive line, opening up holes for the running game, makes North a favorite to claim a fourth straight league title this fall. Also, if you are into battles at the line of scrimmage, then keep the Sept. 28 game with Milford circled, as Clemente and North take on the Hawks and their heavily-recruited lineman Kevin Pyne. The Bombardiers will have a lot of offense to try and account for after the graduation of Cam Furtado and Elvin Sam, and Cote is one of the players that will try to keep the Attleboro offense clicking this season. 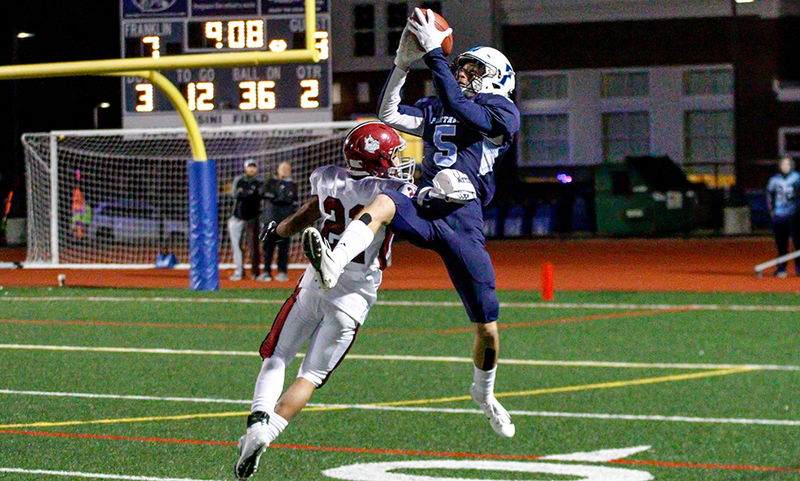 Cote is listed as a wide receiver but was used in a number of ways by head coach Mike Strachan last fall, scoring five touchdowns on the ground and catching four others, and that versatility causes matchup problems for opposing defenses that are trying to keep tabs on him. He is quick with a low center of gravity that makes it hard for defenders to corral him and Cote showed that he can also fight for the extra yards when needed. Whether out of the backfield or split out wide, expect Attleboro to find ways to get the ball in his hands often and let him make big plays. Foley started last season splitting time with Devin Hassett and this year will take over the full-time job at starting quarterback, trying to get the Warriors back to the top of the Davenport division for the first time in three seasons. Foley tossed a pair of touchdown passes last year, and he will be asked to build on that experience to lead the Foxboro offense this fall. The Warriors typically focus on the ground game first, but Foley has shown that he can make plays downfield and has a strong arm that allows him to make quick, accurate throws. He can also keep the ball and, like Hassett last year, get crucial yards when necessary. 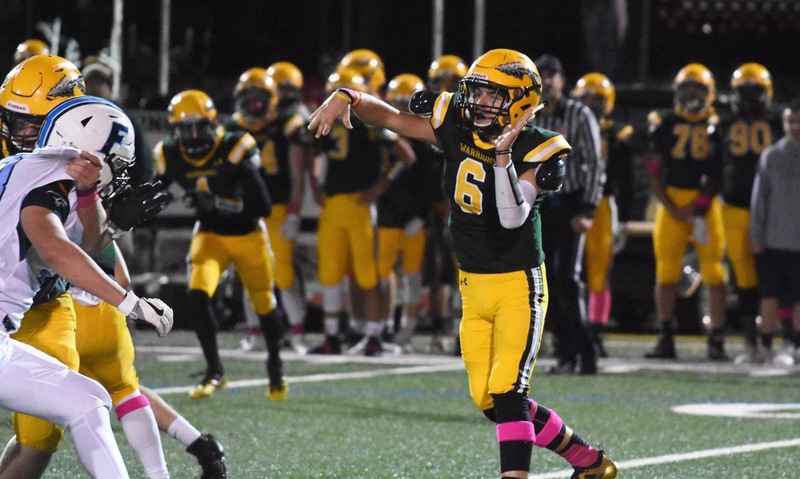 Foxboro was very close to getting back on top in the league last fall, and Foley will be hoping to step in and get the offense going for the Warriors. The Bulldogs were a young team last fall, and that experience will be critical for Canton to make a push for the state tournament. One of the players that will benefit from a year on varsity is Hagan. The junior quarterback tossed four touchdown passes last year and ran for two others, showing flashes of the dynamic, all-around game that earned him the starting role as a sophomore. Canton typically keeps the ball on the ground, but the graduation of Alec Ragusa could open the offense up more for Hagan to have the ball in his hands. He has the toughness and strength to grind out yards in the ground game and showed good accuracy throwing while on the run. His ability to make plays outside the pocket gives the Bulldogs additional options offensively, but it will be his improved decision-making after a year under center that could propel the young Bulldogs up the league standings. Milford senior Sean Lehane made a big impact for the Scarlet Hawks last season. As the kicker, he was a game changer for both the offense and the defense. His kicking power and accuracy gives Milford a shot at points from spots on the field that other offenses don’t have. And on top of that, extra points aren’t always a sure thing at this level so Lehane gives the Hawks stability and confidence there. When it comes to helping the defense, his deep kickoffs and punts can help Milford dominate the field position battle. Lehane will also try to give the Hawks a boost while on offense as the senior will see time as a wide receiver. He’s shown what he can do with his feet so it will be interesting to see how he can help the Hawks’ offense with his hands. Two years removed from being named HockomockSports.com Underclassman of the Year, Taunton senior quarterback Noah Leonard is now in his third season under center for the Tigers and a veteran in the system installed by third-year head coach Brad Sidwell. Leonard helped Taunton achieve a winning record last fall, despite his touchdown total dropping from 14 as a sophomore to 11 as a junior. With a cadre of returning receivers and plenty of size on the line, Leonard has the chance to be in complete control of the offense this year, continuing to develop as a runner (six touchdowns on the ground last year) to complement his accuracy out of the pocket. The Tigers will be hoping to build on the momentum of a three-game win streak to close out 2017 and if Leonard can keep the Taunton offense moving, and avoid turnovers, then another trip to the postseason could be in the cards. 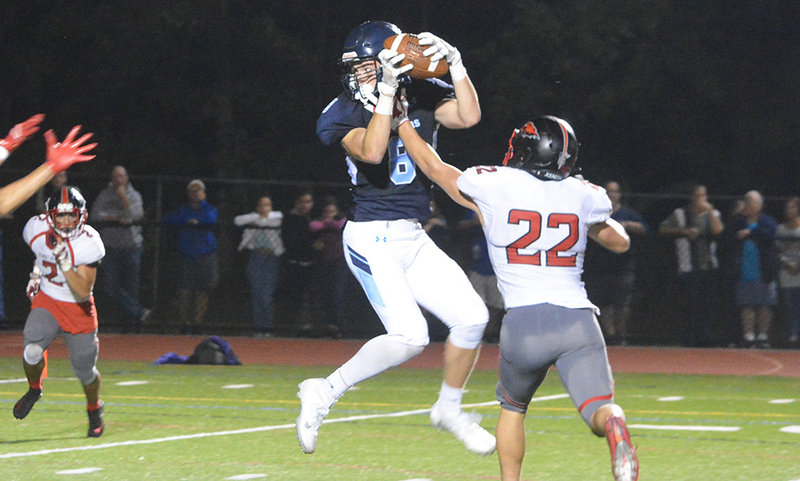 Sean Leonard emerged as one of the top targets for Franklin quarterback Jake Noviello last fall and was one of the top big-play receivers in the league in his second season as a starter. Leonard had 36 catches for 561 yards as a junior and caught eight touchdowns. Capable of making plays down the sidelines with his speed, Leonard is also a threat through the middle, forcing defenses to cover that space and providing a tough matchup for coverage schemes by lining up in multiple positions. This season, Franklin may look to get the ball into Leonard’s hands in a variety of ways to take advantage of his playmaking ability while also using him as a good edge blocker to allow the ground game to flourish. With Noviello gone, the QB position is up for grabs this fall but Leonard will remain a player that the Panthers will look for as often as possible to keep the offense clicking. North Attleboro’s offense is going to look a little different this season without three-year starter Chad Peterson under center, but the Rocketeers will have plenty of weapons for the next quarterback to utilize, including the multi-talented McHugh. One of North’s most dangerous weapons during its run to a third straight league title and the Div. 3 Super Bowl, McHugh rushed for 641 yards and scored 17 touchdowns. He also caught 19 passes for more than 300 yards and another three touchdowns. His speed to get to the edge and ability to turn upfield on a dime made North’s jet sweep effective even when teams knew it was coming. McHugh also has great hands and was able to find seams in the secondary either in the middle of the field or down the sidelines. The Rocketeers do not mind grinding out long drives, but McHugh gave them the capability for big plays on every snap and that will be a key this fall for the Davenport division favorites. One of the most highly-recruited players in New England has made his way to the Hockomock League this season and will be an imposing addition to the Milford offensive line. Pyne is listed at 6-foot-8 and 275 pounds and has been a dominant force for Millis, helping that program continue its dominance in the lower divisions. With a number of Div. I college offers in his pocket, including the likes of Michigan and Boston College, Pyne will present a unique challenge for a league that has prided itself on the strength of its defenses. Coaches will surely be targeting pass rushes away from Pyne and will face the daunting task of trying to get around him to tackle the ball carrier. With quick feet, strength, and good balance, Pyne will be a wall that teams will have to try and maneuver to get into the Milford backfield and should give Milford more options on the offensive side of the ball to try and make a run at a league title and a return to the postseason. Mansfield will be gunning for a return to the top of the Kelley-Rex division this season and the Hornets have a number of skilled players back to make it happen, including Scott. The senior signal caller will be in his second season as the full-time starter, after finishing fourth in the league with 12 touchdown passes last year. Scott has a big arm and great vision downfield to find receivers that other quarterbacks might have missed. 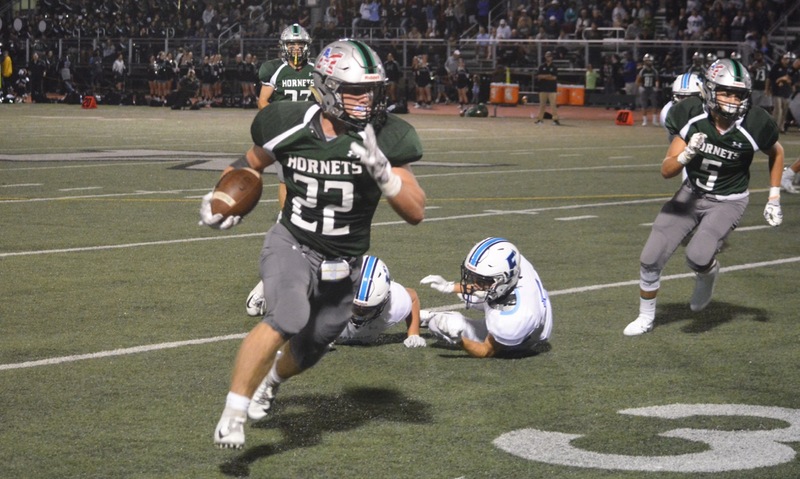 Even with the graduation of record-setting receiver Hunter Ferreira, Scott will have plenty of weapons to take advantage of, particularly out of the backfield, and as he continues to get more comfortable in the pocket the Hornets offense will get increasingly dynamic. Expectations are typically high at Alumni Field this season and those expectations are further fueled by Scott’s experience and talent in running head coach Mike Redding’s balanced offense. 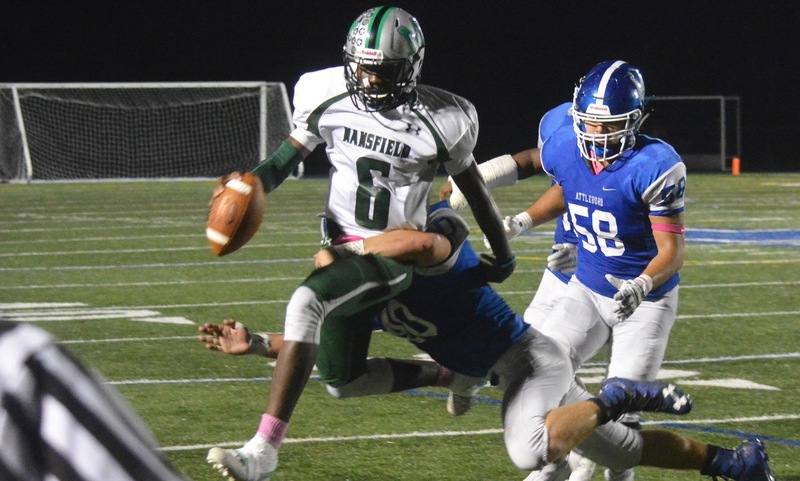 Mansfield will be tested early and, as usual, the Sept. 28 game against King Philip is already circled as the biggest test for Scott and the Hornets in the league.